It's no wonder they're also known as Better-Than Crack Brownies. They're so addicting. They're literally as rich as fudge. Grease a 9x13-inch baking dish and set aside. Mix your batch of brownies according to package directions and bake for 23 minutes. Remove from the oven and top with peanut butter cups and peanuts. Return to the oven and bake for another 5 minutes. 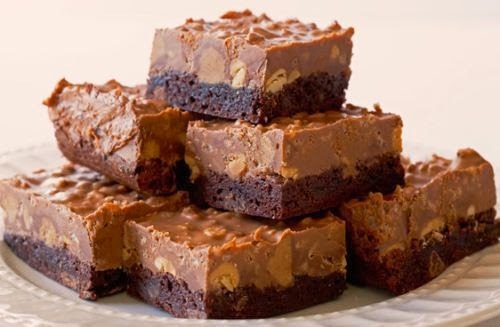 While the brownies finish baking, combine the milk chocolate chips, peanut butter, and shortening. Melt in the microwave until creamy. Stir in the vanilla and combine. Next, add cereal and mix well. Once the brownies are done baking, remove from the oven and pour the cereal mixture on top. Spread into an even layer and let cool. Transfer the brownies to the fridge and let set for 3 hours. Enjoy!